Firstly, by the time you read this I hope you will be reflecting on what will have been an excellent 50th anniversary celebration of our great specialty. We hope that many of you were able to participate in some way and that you captured some great memories. I really hope also as many of you as possible will join us for the Academic Celebration Day on 17 November at the RSM – please do support this excellent one off event! Some tickets are still available. Of course October was not only a month of celebration about 50 years. There was one other key highlight too. The joint launch of the workforce strategy with NHS England, NHS Improvement, HEE & the RCEM was I believe a landmark moment for us. The past 8-9 months have seen intense discussion and at times rather frustrating debate trying to make the various key bodies of the NHS in England appreciate the scale of the challenge facing the emergency care workforce. More about the devolved nations & Ireland below. Indeed I was told in no uncertain terms in December 2016 that the expansion of trainee numbers by plus 75 which had been in place for the last three years would be definitely coming to an end this year and we would return to 225 training places for Emergency Medicine. My advice at that time was it was the equivalent of shooting yourself in both feet and would have a very adverse effect on many levels to the stability of emergency care delivery! I argued strongly that we must not only address the issue of training numbers but have a much bigger debate and solve the wider workforce issues. We have described the solutions very clearly in our RCEM Vision 2020, indeed in many ways we have been talking and providing solutions about this ever since 2012 when we launched Creating successful, satisfying and sustainable careers in Emergency Medicine. The 10 point action plan that we agreed as an Executive to help solve the workforce crisis was presented to NHSI and HEE in March 2017. Discussions have been frustrating at times due often to the number of ‘players on the top table’ with whom I seemed on an interminable ‘Groundhog Day’ shuttle diplomacy exercise. It was therefore with a huge sense of pleasure (and relief!) that all of our efforts resulted in the announcement on 12 October of a truly comprehensive workforce strategy that will strengthen the needs of our emergency care systems greatly. Indeed we have managed to negotiate 95% of what we asked for and have left the door open on other elements as well. 300 funded training places at ACCS and a further 100 training posts at different levels of entry for the next 4 years. A total of 400 training places – an 80% increase from our baseline of 225. A clear commitment to the eventual delivery of the 2200 extra consultant level senior decision makers in England that we have been seeking as part of RCEM Vision 2020 with a very positive tipping point of delivery I would hope within three years as well as a structure that will meet future demand. Development of a structured and funded leadership development programme for every trainee from CT1 through to ST5 of 3-4 days increasing steadily so that ST6 trainees are provided with dedicated training to prepare them for life as a trained emergency physician. A clear commitment to fund and deliver a shopfloor Clinical Educator programme for all those in training in the 30% of EDs identified by the GMC survey to be in most need with a strong recommendation to others that they should instigate the same at the earliest opportunity to support trainees on the shopfloor. Commitment by NHSI & HEE to work with RCEM to describe to provider organisations in England exemplar models of best practice for the multidisciplinary workforce that is required in a modern day ED. A commitment to support development of Clinical Development Fellow programmes and better toolkits/support for SAS doctors and CESR programmes. Increased support for ACP as well as Physician Associate programmes to create a proper multidisciplinary ED workforce. A better integrated international programme to support recruitment for ‘work, learn and return‘ fellowship schemes. One I really like is (conflict of interest, I am 55 next year!) 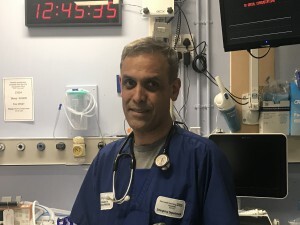 – RCEM and NHS Improvement will work together to jointly describe how we can better support Emergency Medicine consultants at different stages of their career – for example consultants in the first 3-5 years after starting, new Clinical Directors, those aged over 55 as well as those nearing retirement age – to improve retention in these groups and share best practice widely across Trusts. There are other items within the strategy statement which you can find on our website. I hope you can see how comprehensive the strategy is. There is I believe a clear sense of a ‘shared vision’ that we have been fighting for and also a commitment that there will much more work to do and deliver on to make this truly succeed. The strategy will undoubtedly provide the framework to grow our ED workforce to meet present and future demand. It will also provide strategies that help improve training and reduce the attrition rate in our specialty as well as improving retention for senior decision makers so that we maximise the talent base at every level. We should be very proud that we now have better tools to help deliver on this. But…it will take time! There is a clear recognition within the strategy that the role of the modern day emergency physician can be highly stressful and this has led to an increasing requirement for both ‘breadth and also depth of cover’ with extended hours of working to cope with demand.The different functions within an emergency department therefore need to be delivered concurrently increasingly by a consultant but also other senior decision makers such an experienced SAS doctor or ST4+ trainee. These include command and control, resuscitation room leader, supervision of junior staff, rapid assessment function, paediatric ED cover, ambulatory emergency care / CDU cover and de novo review of new patients. The importance of a resilient multidisciplinary ED junior workforce cannot be under estimated. This strategy will take time and will not help us this year or early next year! We face another very difficult winter ahead and ways in which we can maintain safety for our patients and of course our staff is vital. The need to mitigate the effects of crowding in our EDs is an absolute priority. The causes for this are of course complex. We are working hard with NHSI & NHSE on these issues and will publish further guidance soon.We are also working with the regulator in England, the CQC, to give them guidance on the priority areas of safety and will be doing further work with them to make sure our objectives remain well aligned. In addition I have asked the new Chair of the Academy of Medical Royal Colleges, Carrie MacEwen, to have a dedicated summit to discuss the major issues of safety in emergency care this winter across the four nations which she has kindly agreed to and will take place in mid November.We will continue to push hard also with our winter media campaigning to ensure that minds are clearly focused at every level on what needs to happen to improve care delivery in our EDs. Some have rightly expressed the view that elements of the strategy are not explicit enough and that we may not get what is promised. I appreciate the concerns but disagree. We have for the first time brought together some seemingly quite disparate elements of the NHS in England, negotiated hard and produced in a relatively short period of six months a coherent strategy (the GP Forward View took 2 years plus to negotiate). There will be a need to follow up with further more detailed papers explaining how we best achieve success of that there is no doubt. We will be watchful but need to engage fully and be committed to make it work!The months ahead will require clarity of purpose to agree a very good implementation plan and to ensure a joint annual review process between all the key players until we can get this right. We will also need your support and feedback so that we can drive the process both from the centre and also provider organisations. All of the above pertains to England and the RCEM is of course representative of members and fellows in Scotland, Wales, Northern Ireland and the Republic of Ireland as well as those working internationally. Needless to say the Vice Presidents from the other devolved nations have all been aware of the workforce discussions as they now sit on the Executive Board of RCEM. They have helped and contributed to the development of the strategy and will be feeding back via their relevant Boards to their Health Ministers. The fact we have achieved agreement in England will I hope be only an early sign for progress in the other countries too and I am very grateful to the VPs for all their help and support. We hope in a range of future meetings in the devolved nations to discuss and describe tailored solutions that can help improve matters for all our colleagues. In the ROI, I look forward to discussions with IAEM colleagues, Gerry McCarthy, Emily O’Connor and others in Galway & Adare in the near future on how RCEM can best assist and help. It has of course been a real pleasure, honour and privilege to complete my first year as your President. We have travelled some hard miles. So much has happened and though we have won some battles, there is still so much more to be done. I look forward to meeting some of you at the various regional and national meetings in the near future to discuss matters further. Or even at the Academic 50th Anniversary Celebratory conference at the RSM on 17 November 2017 – it is going to be an excellent ‘once in a generation‘ event and I hope you can find your way to grabbing one of the last few tickets left!